I was thrilled to see the latest copy of Crochet Today! 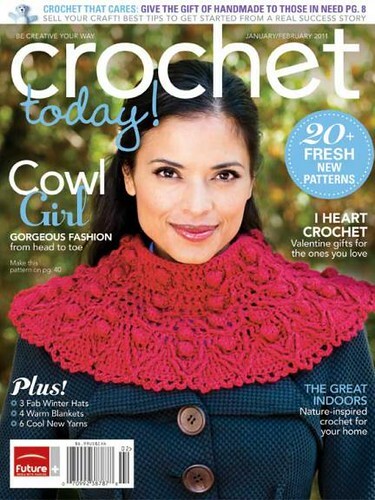 magazine–that’s my cowl design on the cover! The new editor asked me to do something special for the cover, so I pulled out all of the [post stitch, cluster, chain loop, and varying stitch height] stops to create the Blazing Cowl. I had a LOT of fun designing this and wwent a little (lot) crazier than I usually do for this publication (because it is so good at keeping it simple). You can’t see from this picture, but there are seven tiny buttons in the back so that you can take the cowl on and off without messing up your hair. I love small details like that. I made a Ravelry project page for it so that you can see some more close-ups of the page. There’s also a crochet-along forming in the Crocheter’s Today group, so go check it out if you want to play along. Please keep in mind that this design is for the experienced crocheter–if you can read diagrams, this one is super helpful. One of my laments as a designer is that more publications don’t use diagrams. I know, they cost more money–I paid out of pocked to have them included in both of my books. It wasn’t cheap, but worth every penny. There are some things I want to do with stitches that can’t really be explained in words–or rather, can, but get so wordy that they are confusing. For me, the diagrams make is so much easier to get the gist of how the stitches are going to work in relation to each other, and I’m glad that Crochet Today includes so many of them. I also have three (!) other designs this issue; here they are on ravelry: Snowball Cap, Heart Hat and Nature Basket (shown above). Both hats come in multiple sizes, so check them out. FYI, The heart hat that the girl in the photo is wearing was actually made in the adult size, but I guess there were some changes at the photo shoot. Keep in mind that it will fit more closely if made in the appropriate size (toddler, child, adult). There’s a little something for everyone in this issue, and plenty of time to work up any of these projects by the 25th. Have fun! Wow, love the cowl! Sorry I missed this one on the stands! thanks! if you hurry you might still find it, but if not, they've finally put up back issues for sale on their website. Sweet stuff! 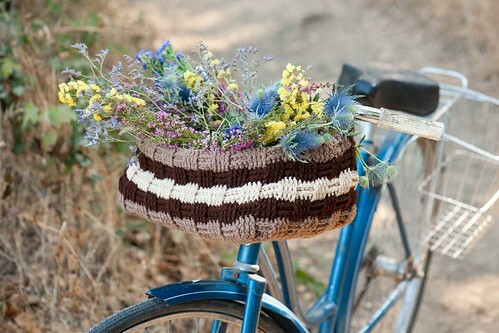 I adore the picture with the basket! I love that snowball hat! And congrats on the cover!